Aaron and his children were headed for Sentry Island – seven miles across the bay from Arviat – a popular spot for picnics, hunting and fishing, where they planned to harvest some of its abundant supply of Arctic tern eggs. In dappled summer sunshine, the island is idyllic – a place of rugged moorland, shingly beaches, and brilliant green shrubs. Unfortunately, polar bears like tern eggs, too, and the family hadn’t been there long when Gibbons realised that a mature male, 9ft in length from jaws to rump, was stalking them. He yelled at the children to get back in the boat, and as they scrambled to escape, he stood his ground on the beach. For reasons that remain unknown, he was without his rifle. The bear pounced, and while his 12-year-old daughter desperately radioed for help, Aaron was mauled to death…..
Arviat, population 2,800, is a snowy huddle of low, well-insulated buildings and very remote. The nearest road connected to the rest of Canada is at Winnipeg, 800 miles away. For six days before my arrival, blizzards and ice on the runways had forced the Arctic carrier Calm Air to cancel its Arviat flights. Last week, Arviat’s minimum temperature hit minus 36C. However, as I rapidly discovered, its people – who are almost all Inuit – are as warm as its weather is brutal. Scared and exasperated by the threat the bears pose, some Inuit leaders are voicing a demand which, if granted, may trigger a global furore akin to Japan’s decision to resume commercial whaling. They want to be allowed to increase their permitted polar bear hunting quota to reduce numbers. Like almost any story about polar bears, the summer maulings were soon slotted into a familiar narrative. 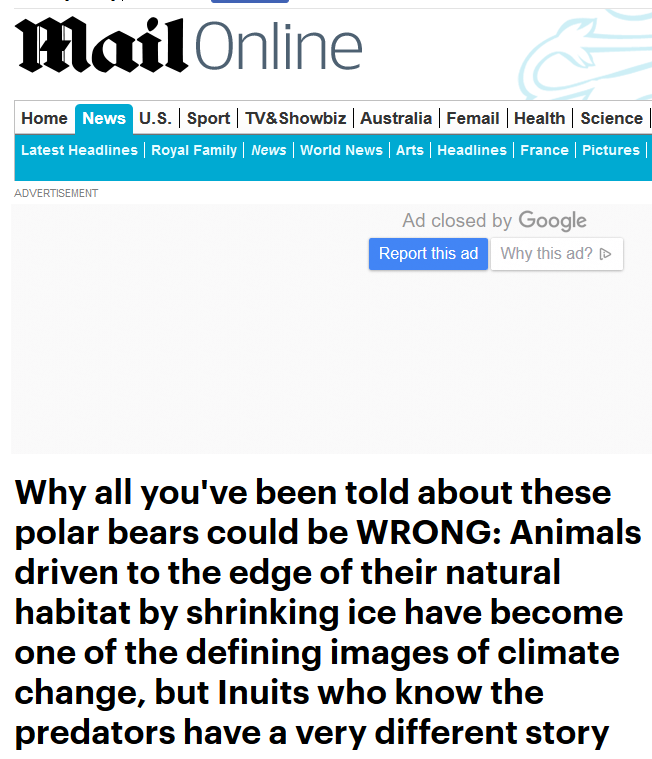 They were, it was claimed, one more symptom of climate change caused by humans, which is said to be rapidly driving the bears towards extinction. According to PBI’s conservation director, Geoff York, ‘what we’re seeing across the Arctic as sea ice recedes is that more polar bears are spending time on shore… It is creating that perfect storm of potential for human-bear conflict’. All that was happening was that the bears were spending more time near humans, and hence becoming more visible. Around the Arctic, polar bears – estimated by the International Union for Conservation of Nature to number in total about 26,000 – are divided into 19 ‘sub-population’ groups. Prof Derocher said he had ‘no hesitation’ in saying that the sub-population in the Arviat region, known as West Hudson Bay, has ‘declined from historic levels’. Eventually, the level would become ‘unsustainable’. Already, he says, the bears have become skinnier and less able to reproduce, while fewer cubs grow to adulthood. The people of Arviat vehemently disagree, their knowledge derived from centuries of survival in the harshest environment imaginable and co-existence with bears and other wildlife. Inuit elder David Alagalak, 74, spent his early years living in a traditional stone hut, and shot his first adult bear in 1952, when he was nine. Mayor Bob Leonard, originally a southerner who has lived in Arviat for 45 years, agrees: ‘Something has happened in the past six or seven years. We never used to see bears, even if we went camping somewhere like Sentry Island. People are angry and afraid. The full story is worth reading. David Rose and the Inuit he has spoken to confirm what sceptical scientists such as Dr Susan Crockford have been saying for some time. Yet still Derocher and his chums at the activist PBI deny reality.